CoreTechnologie (www.coretechnologie.com), a global provider of CAD converter, CAD viewer and 3-D interoperability software, has launched a new manufacturing software suite called 4D_Additive. In order to cope with the fast development of additive-manufacturing (AM) and small-series production, the German-French company has introduced this powerful software suite to prepare CAD models for all major 3-D printing methods. 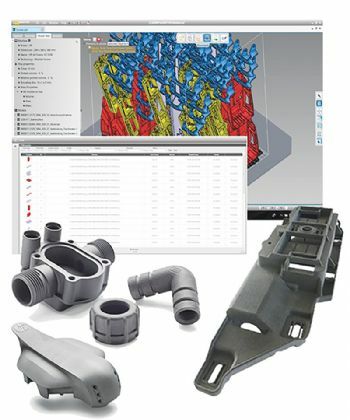 The key feature of 4D_Additive is that CAD data from all current systems — including Catia, NX, Solidworks, Creo, STEP and JT — is read by precise native interfaces and processed as exact B-Rep geometry, including all contained product-manufacturing information (PMI). This makes it possible to analyse, repair and prepare the 3-D models with the highest precision and to CAD engineering standard. With conventional 3-D printing software, CAD models are usually triangulated — converted to STL — in the reading process, which makes it impossible to handle or repair the geometry without deviating its original shape. 4D_Additive avoids this problem because of its exact geometry kernel and the fact that CAD models remain in their original geometry description until the end of the process. In the final slicing step, exact vector graphics can be generated, depending on the machine type. These exact curves can be processed directly as straight lines, circles and arcs. The software also supports 3MF, AMF and STL output formats. 4D_Additive has a modern easy-to-use interface and innovative features such as automatic 3-D nesting, as well as a collision check and distance control for automated and safe placement of the parts in the build space. The dynamic roughness analysis enables the user to deter-mine the optimal alignment of the part within seconds in order to achieve the best possible surface quality, shortest manufacturing time or lowest costs. The know-how database of the system contains settings for all major machine types and related information about the AM method, so that important parameters are pre-set when the user selects a machine. Moreover, the module for texture generation is easy to use and is based on the exact geometry, which allows the precise definition of the texture on the transitions, as well as the faces. More than 5,000 pre-defined textures are available for the system. The Partfinder reads native and standard-format CAD files directly at the file system level and analyses the geometry, design elements, PMI and attributes. All information is stored in an internal database. Subsequently, the parts are filtered with the help of a free definable search mask according to the desired search criteria and displayed clearly with a 3-D graphic, as well as all relevant information in a list. By multi-processor calculation, components with 3-D printing potential can be found quickly and easily — even those with very large amounts of data.